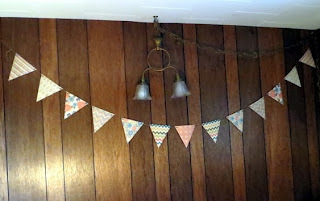 This banner was so fun to make for the bedrooms at my summer cottage, and so much faster than a fabric version. 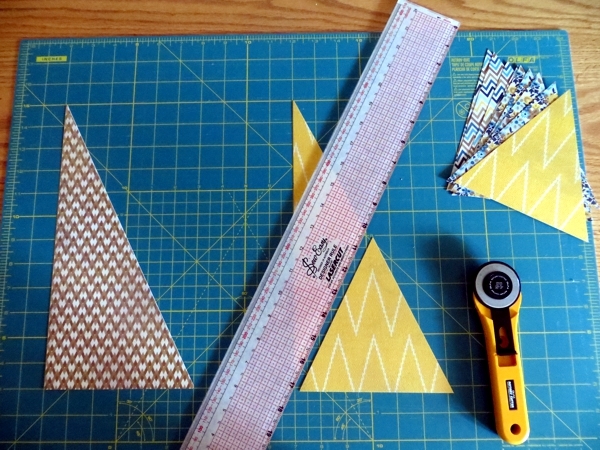 First, cut away the edges of your paper to leave triangles. 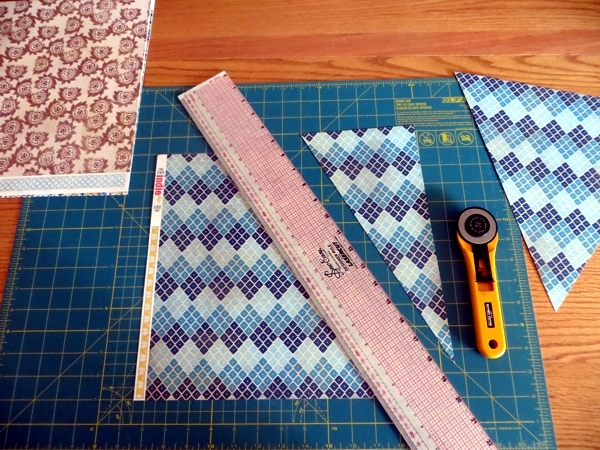 ... and I was able to cut more 6" wide ones from the scraps left behind. 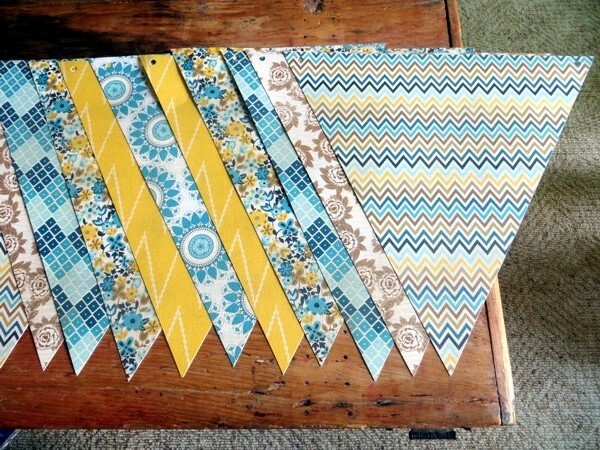 You can get three pennants from just one square sheet! That's sooooo many banners. 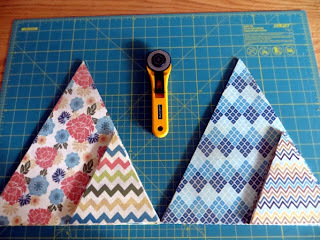 Next up: use your hole punch to snap circles into the two corners of the top side of your triangle. 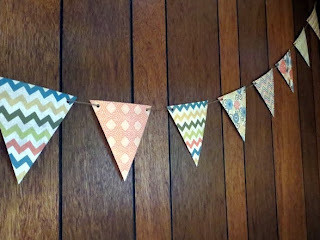 Don't get too close to the edges, and stay pretty consistent across all the pennants. Now, protect the holes by applying reinforcement stickers. 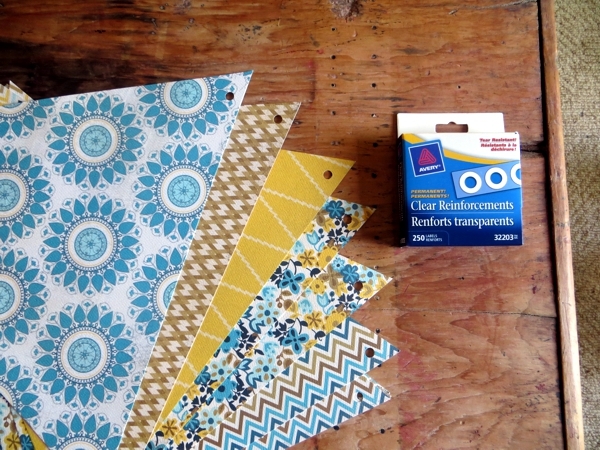 I used clear for mine, but I saw brightly coloured stickers at the office supply store that would make a fun contrast for a solid or complementary paper. 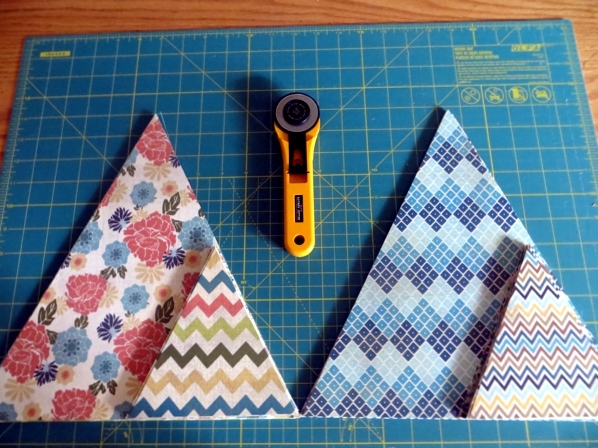 How many pennants you will need depends on how wide an area you're planning to cover. 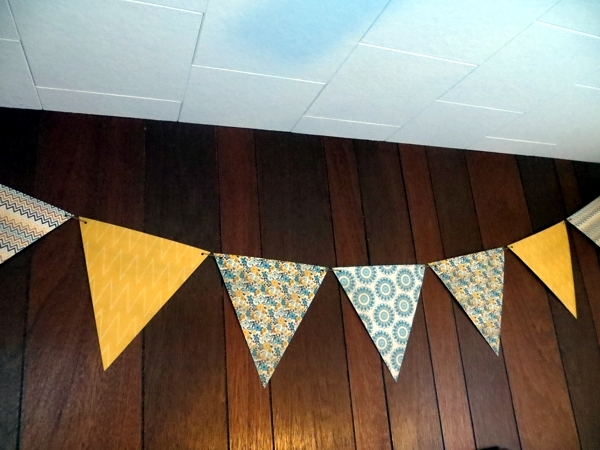 For my 96" wall, I used 7 9-inch pennants and left a little space between each one. Certainly, you don't want more banner coverage than wall, even if you do plan a big drape, because you will lose a little real estate in the corners. 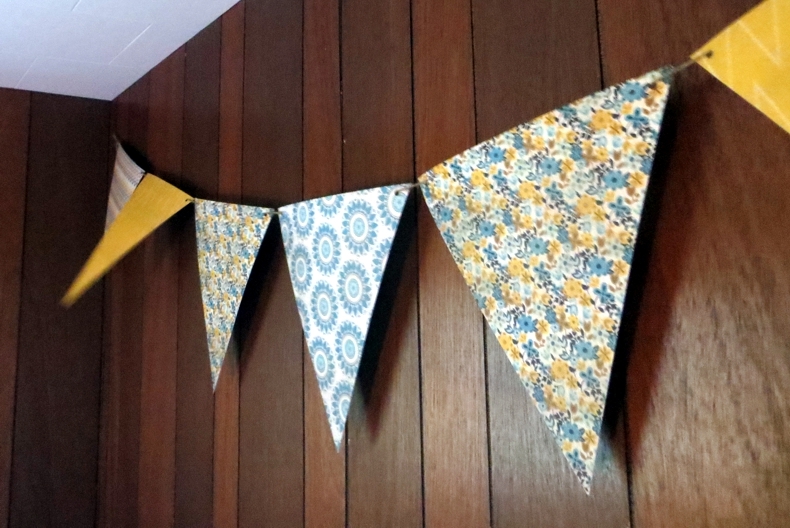 I like to make a one-off patterned pennant the centre, and line up other patterns in sequence on either side. 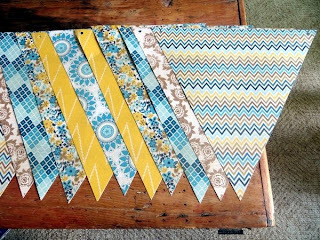 Whatever you choose it helps to get the pennants stacked up in order before you start stringing. 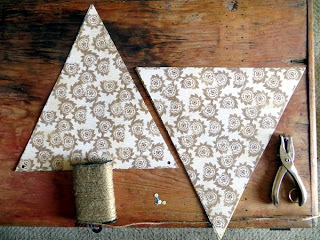 String them so that the twine goes front to back into the right-hand hole, and back to front on the left. The strung banner is very portable (or store-able) if you fold it accordian style. 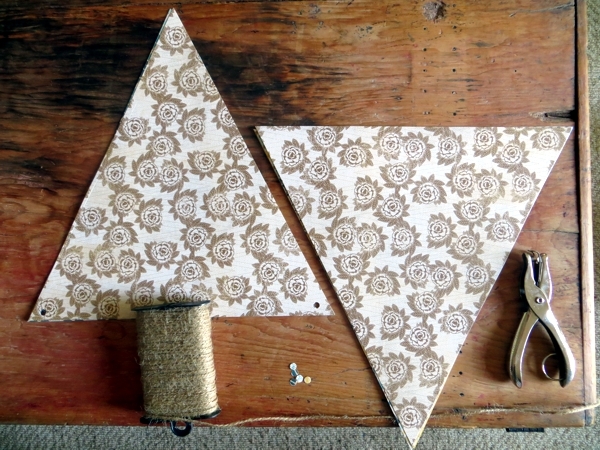 And now the fun part starts: hammer a nail into each of the upper corners of the wall where you want to display your banner, tie loops in either end of the twine, and hang it up. 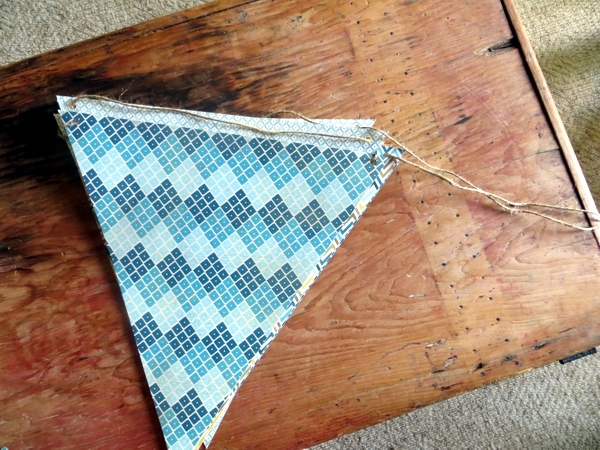 It's so easy to adjust the space between individual pennants once they're up - on rough twine, they won't slip at all. We think this funny, off-centre lamp makes the pennants look like teeth and its shades like goofy monster's eyes. Amazingly: it's still possible to sleep underneath it. It's also possible to sleep if you have a ceiling fan on top speed, blowing the pennants up and down off the wall. Probably the fan masks the sound of the moving paper. 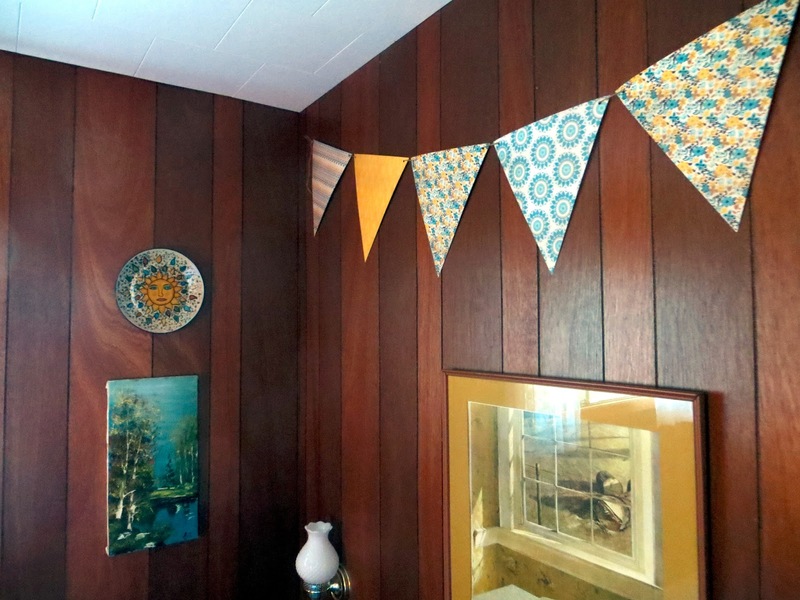 Hardly took any time at all to brighten up these brown wood panel walls - a lot less than painting, that's for sure! And they make every vacation day seem more like a party. Who doesn't want that? Have a great day and thanks for stopping by to see my paper project! Thank you for the info! Wasn't quite sure how I should string mine. Making a valentine banner for my mantel. Is this cardstock, or just regular weight? I went to the store today and couldn't find the cute prints I was looking for, but I thought I'd check on the weight of the paper before I bought. Thanks! Juli, I used cardstock scrapbook paper for this project, but you do have to check because a lot of scrapbook paper is just an ordinary paper weight! You could still use that but I would definitely reinforce the holes with those little stickers in that case, and I wouldn't expect the banner to hold up for as long. How has this held up? Should I expect the corners of the paper to curl up over time? 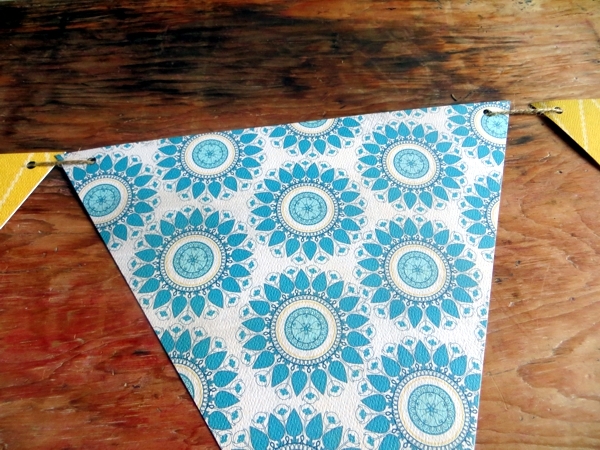 Mine is made from heavy cardstock, so the edges should stay flat if you do that. Lightweight paper might well curl over time, but I suppose it would depend on the humidity in the room where it's hanging?